Myrmoteras worker, copyright Steve Shattuck. Contains: Lasiini, Melophorini, Formica, Plagiolepidini, Camponotini. The Formicinae is a clade of ants characterised by the presence of an acidipore, a circular or semicircular terminal opening on the gaster in place of the reduced sting that is often fringed with hairs (Wheeler & Wheeler 1990). The acidopore is used to secret and/or spray formic acid, which is used for defense in lieu of a sting. Members of the Formicinae include the weaver ants of the genus Oecophylla, which are found in the Old World tropics and build arboreal nests by weaving together leaves with the silk produced by larvae. The Myrmelachistini include two genera of ants sharing a reduced antennal segmentation (with nine or ten segments), five mandibular teeth and anterior tergosternal fusion on the first gastral segment. Members of the mostly Holarctic Formicini have closely approximated metacoxae, an elliptical to slit-shaped propodeal spiracle, a double row of stout setae on the metatibia, and workers possess ocelli (Ward et al. 2016). [B03] Bingham, C. T. 1903. The Fauna of British India, including Ceylon and Burma. Hymenoptera vol. 2. Ants and Cuckoo-Wasps. Taylor and Francis: London. [D59] Darwin, C. 1859. The Origin of Species by Means of Natural Selection, or the preservation of favoured races in the struggle for life 1st ed. John Murray: London. (reprinted 1967. Atheneum: New York; 1968. Penguin Books: London). [H79] Howse, P. E. 1979. The uniqueness of insect societies: Aspects of defense and integration. In: Larwood, G., & B. R. Rosen (eds) Biology and Systematics of Colonial Organisms pp. 345–374. Academic Press: London. [N-ZLI11] Nur-Zati A. M., G. T. Lim & A. B. Idris. 2011. 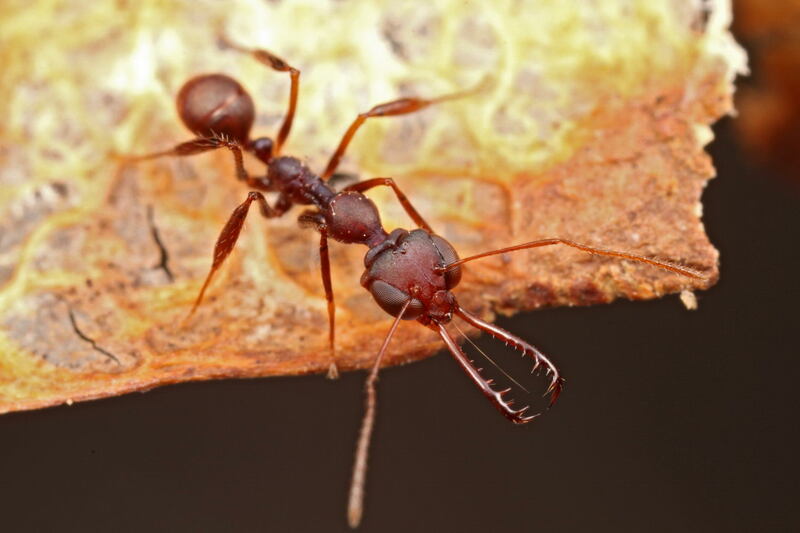 Checklist of ants of selected hill dipterocarp forests of peninsular Malaysia. Serangga 16 (1): 91–105. [TB85] Taylor, R. W., & D. R. Brown. 1985. Formicoidea. In: Walton, D. W. (ed.) Zoological Catalogue of Australia vol. 2. Hymenoptera: Formicoidea, Vespoidea and Sphecoidea pp. 1–149. Australian Government Publishing Service: Canberra. [WBF16] Ward, P. S., B. B. Blaimer & B. L. Fisher. 2016. A revised phylogenetic classification of the ant subfamily Formicinae (Hymenoptera: Formicidae), with resurrection of the genera Colobopsis and Dinomyrmex. Zootaxa 4072 (3): 343–357. [WW90] Wheeler, G. C., & J. Wheeler. 1990. Insecta: Hymenoptera Formicidae. In: Dindal, D. L. (ed.) Soil Biology Guide pp. 1277–1294. John Wiley & Sones: New York. [Z02] Zherikhin, V. V. 2002. Insect trace fossils. In: Rasnitsyn, A. P., & D. L. J. Quicke (eds) History of Insects pp. 303–324. Kluwer Academic Publishers: Dordrecht. Last updated: 25 September 2017.